^ Haynes, William M., ed (2011). 化学と物理のCRCハンドブック（英語版） (92nd ed.). CRCプレス（英語版）. p. 4.122. ISBN 1439855110. ^ James, Arthur M.; Lord, Mary P. (1992). Macmillan's Chemical and Physical Data. London: Macmillan. ISBN 0-333-51167-0. ^ a b Dye, J. L. (1979). “Compounds of Alkali Metal Anions”. Angewandte Chemie International Edition 18 (8): 587–598. doi:10.1002/anie.197905871. ^ Davy (1808) p. 25. ^ a b c d Holleman, Arnold F.; Wiberg, Egon; Wiberg, Nils (1985). “Potassium” (German). Lehrbuch der Anorganischen Chemie (91-100 ed.). Berlin: Walter de Gruyter. ISBN 3-11-007511-3. ^ Burkhardt (2006) p. 35. ^ Burkhardt (2006) p. 32. ^ Cameron, A. G. W. (June 1957). Stellar Evolution, Nuclear Astrophysics, and Nucleogenesis. Chalk River Laboratory report CRL-41. http://www.fas.org/sgp/eprint/CRL-41.pdf. ^ a b c Georges, Audi (2003). “The NUBASE Evaluation of Nuclear and Decay Properties”. Nuclear Physics A (Atomic Mass Data Center) 729: 3-128. Bibcode 2003NuPhA.729....3A. doi:10.1016/j.nuclphysa.2003.11.001. ^ Winteringham, F. P. W. (1989). Radioactive fallout in soils, crops and food. FAO Soils Bulletin 61. Rome: Food and Agriculture Organization of the United Nations. p. 32. ISBN 9789251028773. http://books.google.de/books?id=KRVXMiQWi0cC&pg=PA32 2011年5月15日閲覧。. ^ Monroe, James Stewart; Wicander, Reed; Hazlett, Richard W. (2007). Physical Geology: Exploring the Earth (6th ed. ed.). Belmont, CA: Thomson Brooks/Cole. p. 80. ISBN 9780495011484. http://books.google.de/books?id=iXfhFnoQBQ0C&pg=PA80. ^ a b c Prud'homme, Michel; Krukowski, Stanley T. (2006). “Potash”. In Kogel, Jessica Elzea; Trivedi, Nikhil C.; Barker, James M.; Krukowsk, Stanley T.. Industrial Minerals & Rocks. Littleton, CO: Society for Mining, Metallurgy, and Exploration. pp. 723–740. ISBN 9780873352338. http://books.google.com/books?id=zNicdkuulE4C&pg=PA723. ^ Burkhardt, Elizabeth R. (2003). “Potassium and Potassium Alloys”. In Ullmann, Fritz; Bohnet, Matthias. Ullmann's encyclopedia of industrial chemistry. 29. Weinheim: Wiley-VCH. p. 83. ^ Garrett, Donald E. (1996). Potash: deposits, processing, properties and uses. London: Chapman & Hall. ISBN 9780412990717. http://books.google.de/books?id=EHx51n3T858C. ^ Wishart, David J. (2004). Encyclopedia of the Great Plains. University of Nebraska Press. p. 433. ISBN 9780803247871. http://books.google.de/books?id=rtRFyFO4hpEC&pg=PA433. ^ Micale, Giorgio; Cipollina, Andrea; Rizzuti, Lucio (2009). Cipollina, Andrea; Micale, Giorgio; Rizzuti, Lucio. ed. Seawater Desalination: Conventional and Renewable Energy Processes. Berlin: Springer. p. 3. ISBN 9783642011498. http://books.google.de/books?id=NXEmcGHScV8C&pg=PA3. ^ Abdelwahab, M.; Youssef, S.; Aly, A.; Elfiki, S.; Elenany, N.; Abbas, M. (1992). “A simple calibration of a whole-body counter for the measurement of total body potassium in humans”. International Journal of Radiation Applications and Instrumentation. Part A. Applied Radiation and Isotopes 43 (10): 1285-1289. doi:10.1016/0883-2889(92)90208-V.
^ Chang, Raymond (2007). Chemistry. Boston: McGraw-Hill Higher Education. p. 52. ISBN 9780071105958. http://books.google.com/books?id=huSDQAAACAAJ 2011年5月29日閲覧。. ^ Campbell, Neil (1987). Biology. Menlo Park: Benjamin/Cummings. p. 795. ISBN 0-8053-1840-2. ^ Lockless, S. W.; Zhou, M.; MacKinnon, R. (2007). “Structural and thermodynamic properties of selective ion binding in a K+ channel”. PLoS Biol 5 (5): e121. PMID 17472437. ^ Schonwald, Seth (2004). 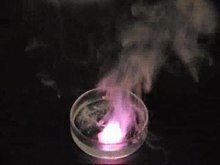 “Potassium Chloride and Potassium Permanganate”. Medical toxicology. Philadelphia: Lippincott Williams & Wilkins. pp. pp. 903-905. ISBN 9780781728454. http://books.google.com/books?id=BfdighlyGiwC&pg=PA903. ^ Marfy, Claire; Cardello, A. V.; Brand, Joseph G. (1981). “Tastes of Fifteen Halide Salts Following Water and NaCl: Anion and Cation Effects”. Physiology & Behavior 26: 1083-1095. http://nsrdec.natick.army.mil/LIBRARY/80-89/R81-77.pdf. ^ Grim, C. E.; Luft, F. C.; Miller, J. Z.; Meneely, G. R.; Battarbee, H. D.; Hames, C. G.; Dahl, L. K. (1980). “Racial differences in blood pressure in Evans County, Georgia: relationship to sodium and potassium intake and plasma renin activity”. Journal of Chronicle Diseases 33 (2): 87-94. doi:10.1016/0021-9681(80)90032-6. PMID 6986391. ^ Karger, S. (2004). “Energy and nutrient intake in the European Union” (PDF). Annals of Nutrition and Metabolism 48 (2 (suppl)): 1-16. doi:10.1159/000083041. http://content.karger.com/ProdukteDB/produkte.asp?Aktion=ShowPDF&ProduktNr=223977&Ausgabe=230671&ArtikelNr=83312&filename=83312.pdf. ^ D'Elia, L.; Barba, G.; Cappuccio, F.; Strazzullo, P. (2011). “Potassium Intake, Stroke, and Cardiovascular Disease: A Meta-Analysis of Prospective Studies”. The Journal of the American College of Cardiology 57 (10): 1210-1219. doi:10.1016/j.jacc.2010.09.070. ^ Folis, R. H. (1942). “Myocardial Necrosis in Rats on a Potassium Low Diet Prevented by Thiamine Deficiency”. Bulletin of the Johns-Hopkins Hospital 71: 235. ^ Committee on Optimization of Nutrient Composition of Military Rations for Short-Term, High-Stress Situations; Committee on Military Nutrition Research (2006). Nutrient composition of rations for short-term, high-intensity combat operations. Washington, D.C.: National Academies Press. pp. pp. 287 ff. ISBN 9780309096416. http://books.google.com/books?id=kFatoIBbMboC&pg=PT287 2011年5月29日閲覧。. ^ Shallenberger, R. S. (1993). Taste chemistry. London: Blackie Academic & Professional. pp. pp. 120 ff. ISBN 9780751401509. http://books.google.com/books?id=8_bjyjgClq0C&pg=PA120 2011年5月29日閲覧。. ^ Slonim, Anthony D.; Pollack, Murray M. (2006). “Potassium”. Pediatric critical care medicine. Philadelphia, PA: Lippincott Williams & Wilkins. p. 812. ISBN 9780781794695. http://books.google.com/books?id=_XavFllbnS0C&pg=PA812. ^ Visveswaran, Kasi (2009). “hypokalemia”. Essentials of Nephrology (2nd ed. ed.). New Delhi: BI Publications. p. 257. ISBN 9788172253233. http://books.google.com/books?id=c4xAdJhIi6oC&pg=PT257. ^ Roy, Amit H. (2007). “Fertilizers and Food Production”. In Kent, James A.. Kent and Riegel's handbook of industrial chemistry and biotechnology. 1. New York: Springer. pp. pp. 1111-1157. ISBN 9780387278438. http://books.google.com/books?id=AYjFoLCNHYUC&pg=PA167. ^ Figoni, Paula I. (2010). “Bleaching and Maturing Agents”. How Baking Works: Exploring the Fundamentals of Baking Science. Hoboken: John Wiley & Sons. p. 86. ISBN 9780470392676. http://books.google.com/books?id=XqKF7PqV02cC&pg=PA86. ^ Chichester, C. O. (1986). “Uses and Exposure to Sulfites in Food”. Advances in Food Research. 30. Orlando: Academic Press. pp. pp. 4-6. ISBN 9780120164301. http://books.google.com/books?id=eblAtwEXffcC&pg=PA4. ^ Kearey, Philip; Brooks, M.; Hill, Ian (2002). “Optical Pumped Magnetometer”. An introduction to geophysical exploration. Oxford: Blackwell Science. p. 164. ISBN 9780632049295. http://books.google.com/books?id=R_Y925b97ncC&pg=PA164. ^ Werner, R. C.; Jackson, C. B. (1957). “Chapter 18. The Manufacture of Potassium and NaK”. Advances in Chemistry. 19. pp. pp. 169-173. doi:10.1021/ba-1957-0019.ch018. ISBN 9780841200203. ISSN 9780841221666. http://pubs.acs.org/doi/abs/10.1021/ba-1957-0019.ch018. ^ Greenwood (1997) p. 76. ^ Siegel, Richard S. (1940). “Ignition of the safety match”. Journal of Chemical Education 17 (11): 515. doi:10.1021/ed017p515. ^ Toedt, John; Koza, Darrell; Cleef-Toedt, Kathleen Van (2005). “Personal Cleansing Products: Bar Soap”. Chemical Composition of Everyday Products. Westport: Greenwood Press. ISBN 9780313325793. http://books.google.com/books?id=UnjD4aBm9ZcC&pg=PA4. ^ Marx, Robert F. (1990). The History of Underwater Exploration. New York: Dover Publications. ISBN 9780486264875. http://books.google.com/books?id=oiWFhoRzPBQC&pg=PA93. ^ Gettens, Rutherford John; Stout, George Leslie (1966). Painting Materials: A Short Encyclopaedia. New York: Dover Publications. pp. pp. 109-110. ISBN 9780486215976. http://books.google.com/books?id=bdQVgKWl3f4C&pg=PA109. ^ Bowen, Robert (1988). “Theory and Assumptions in Potassium-Argon Dating”. Isotopes in the Earth Sciences. London: Chapman & Hall. pp. pp. 203-208. ISBN 9780412537103. http://books.google.de/books?id=k90iAnFereYC&pg=PA207. ^ Marggraf, Andreas Siegmund (1761). Chymischer Schriften. Berlin: Bey Arnold Wever. p. 167. http://books.google.com/books?id=b-ATAAAAQAAJ&pg=PA167. ^ du Monceau, H. L. D. (1736). “Sur la Base de Sel Marine” (French). Memoires de l'Academie royale des Sciences: 65-68. http://gallica.bnf.fr/ark:/12148/bpt6k3533j/f73.image.r=Memoires%20de%20l%27Academie%20royale%20des%20Sciences.langEN. ^ Enghag, P. (2004). “11. Sodium and Potassium”. Encyclopedia of the Elements. Weinheim: Wiley-VCH. ISBN 3527306668. ^ Davy (1808) pp. 1–44. ^ a b Shaposhnik, V. A. (2007). “History of the discovery of potassium and sodium (on the 200th anniversary of the discovery of potassium and sodium)”. Journal of Analytical Chemistry 62 (11): 1100-1102. doi:10.1134/S1061934807110160. ^ Weeks, Mary Elvira (1932). “The discovery of the elements. XI. 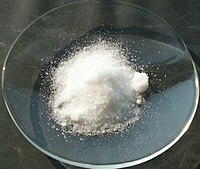 Some elements isolated with the aid of potassium and sodium: Zirconium, titanium, cerium, and thorium”. Journal of Chemical Education 9 (7): 1231. doi:10.1021/ed009p1231. ^ Siegfried, R. (1963). “The Discovery of Potassium and Sodium, and the Problem of the Chemical Elements”. Isis 54 (2): 247-258. doi:10.1086/349704. JSTOR 228541. ^ Browne, C. A. (1926). “Historical notes upon the domestic potash industry in early colonial and later times”. Journal of Chemical Education 3 (7): 749. doi:10.1021/ed003p749. ^ Liebig, Justus von (1840). Die organische Chemie in ihrer Anwendung auf Agricultur und Physiologie. Braunschweig: Vieweg. http://books.google.com/?id=Ya85AAAAcAAJ. ^ Cordel, Oskar (1868). Die Staßfurter Kalisalze in der Landwirthschaft. Aschersleben, Germany: L. Schnock. http://books.google.com/?id=EYpIAAAAYAAJ. ^ Birnbaum, Karl (1869). Die Kalidüngung in ihren Vortheilen und Gefahren. Berlin: Wiegandt & Hempe. http://books.google.com/?id=J8Q6AAAAcAAJ. ^ United Nations Industrial Development Organization; Int'l Fertilizer Development Center (1998). Fertilizer Manual. Dordrecht, The Netherlands: Kluwer Academic Publishers. pp. pp. 46 ff, 417 ff. ISBN 9780792350323. http://books.google.de/books?id=qPkoOU4BvEsC&pg=PA46. ^ Miller, H. (1980). “Potash from Wood Ashes: Frontier Technology in Canada and the United States”. Technology and Culture 21 (2): 187-208. doi:10.2307/3103338. JSTOR 3103338. ^ Rittenhouse, P. A. (1979). “Potash and politics”. Economic Geology 74 (2): 353-357. doi:10.2113/gsecongeo.74.2.353. Greenwood, Norman N.; Earnshaw, Alan (1997). Chemistry of the Elements (2nd ed. ed.). Oxford: Butterworth-Heinemann. ISBN 0750633654. Burkhardt, Elizabeth R. (2006). “Potassium and Potassium Alloys”. Ullmann's Encyclopedia of Industrial Chemistry. A22. Weinheim: Wiley-VCH. pp. pp. 31-38. doi:10.1002/14356007.a22_031.pub2. ISBN 3527306730.